The coastal resort of Cleveleys, famous for its miles of beaches, lies on the Fylde Coast of Lancashire, England, about 4 miles north of Blackpool and 2 miles south of Fleetwood. Nighbouring Thornton is mentioned in the Domesday Book of 1086 as "Torenton", whilst Cleveleys mostly dates back to the nineteenth century when it grew up to accommodate the growing numbers of tourists flocking to the region. It was formerly known as Ritherholm, which name derived from the rivulet that flowed into the sea there. Cleveleys seafront has undergone an award-winning £20 million renovation and boasts a stylish new promenade with a collection of contemporary artworks, iconic architecture, innovative lighting that’s triggered by the tide and a striking pavilion. Mythic Coastline, a series of sculptures and interpretative art appear along the promenade to bring to life a new illustrated book by children's author Gareth Thompson. The town boasts a state-of-the-art cinema, plenty of traditional sea side and high street shops and the popular Jubilee Gardens, at North Promenade, which has a children's play area, crazy golf, a boating lake, a multi-use games area and skate park. Inland at Thornton, an historic eighteenth century tower windmill, Marsh Mill, a Grade II listed building, has been restored to its former glory and offers a unique introduction to milling of a bygone age. Marsh Mill was built in 1794 by Ralph Slater, a Fylde millwright who also built Pilling and Clifton Mills. One of the largest mills in Europe, Marsh Mill stands at a height of 22.8m (70 feet) is also amongst the tallest in the Fylde. Visitors can take a guided tour to the top of the mill or browse around the speciality shops in the surrounding village. A popular tavern and tea-room are situated in the village. Every weekend from Easter to October visitors can enjoy a variety of entertainments featuring brass bands, childrens shows, clog dancing and a train ride on the model railway. The nearby Wyre Estuary Country Park at Thornton is situated on the banks of the River Wyre and is an award winning Green Flag Country Park. Many of the facilities are accessible to disabled people including the use of the Tramper all terrain electric buggy. The Country Park covers the whole estuary from Fleetwood and Knott End up river as far as the Shard Bridge. An extensive network of public paths runs throughout the park, including Stanah, Skippool Creek, Wardleys Creek, Burrows Marsh and Barnaby's Sands. The riverside path offers extensive views over the estuary. A £90,000 adventure playground has recently been opened at the park. There are picnic sites and a special family area with the Visitor Centre as well as a cafe offering refreshments and information. A wide range of events are held at the park all year round. 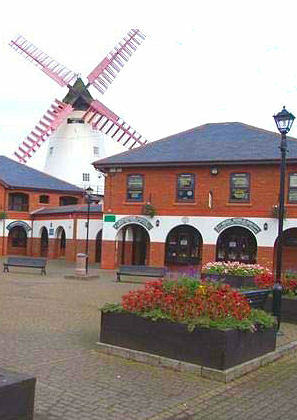 Poulton-le-Fylde -historic market town, situated 5 miles (8 km) to the north-east of Blackpool. With its charming cobbled streets, boasts much character and has something for everyone. Blackpool Tower - first opened to the public on 14 May 1894. Inspired and modelled on the Eiffel Tower in Paris, the tower soars to 518 feet 9 inches (158.12 metres) high above Blackpool’s famous Golden Mile. The Sea Life Centre, Blackpool, billed as a "friendly and authoritative guide to the last great frontier...the seas and oceans of the world and their myriad mysterious and amazing inhabitants." The centre is home to one of the largest collections of tropical sharks in Europe. Blackpool Model Vilage and Gardens an award winning visitor attraction, established in 1972, is set in a stunningly beautiful landscaped 2½ acres of carefully tended gardens with paved pathways that provide full access to visitors.